Hello! Welcome to the Taylored Expressions July Stamp of the Month Blog Hop! I combined the July Stamp of the Month (Cute Hoot) with the July Key Ingredients (featuring patterned paper from the Basic Grey Knee Highs collection) to make a card. I also used the coordinating Curly Cute Hoot dies (sold separately). Accessories: Taylored Dies: Curly Cute Hoot (TE), Foam tape, Thread, Sewing machine. I love your card...the owls are so charming and the stitching just adds the right touch...great job! Darling card Stephanie. Love the cute owls. The clouds are fabulous! 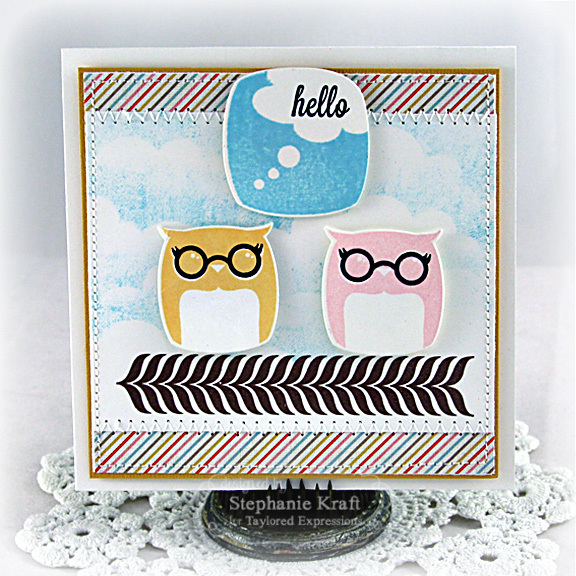 Stephanie, I love your cute "female" owls. You did a cute job on the carde! Sweet card, Stephanie, I love the owls and of course, your stitching! Loving the clouds too, so pretty!